Kaju Katli is a rich and delicious mouth watering dryfruit sweet made from good quality cashew nuts and rich ingredients.Kaju Katli is a Rich, Delicious, Hyginically prepared and is a perfect choice to your dears to make them Happier on Birthdays, Festivals and on all Occasion. 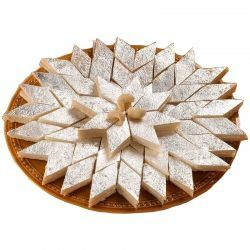 In my opinion, Kaju Katli is the best sweet variety ever found. Thanks a lot Oyc for delivering the best tasting Kaju katli.